U.S. Department of Housing and Urban Development (HUD) Secretary Ben Carson was in St. Louis on Friday to speak on the “Opportunity Zones” program. Dr. Carson joined federal, state, and local lawmakers, as well as residents at the HUD-supported Sarah North Apartments, for a roundtable discussion. “All of our people are so incredibly important. We have to develop our people because we’re not going to be able to compete in a world where China and India have four-times more people than we do unless we really get serious about developing our people, so that’s what this is really all about.” Carson said. The “Opportunity Zones” program offers capital gains tax relief to those who invest in depressed areas. In 2017, President Donald Trump signed the Tax Cuts and Jobs Act, creating Opportunity Zones to stimulate long-term investments in low-income communities. “A lot of investment has already come in all over the country and people have the ability to either buy property, become primary business owners in the area, they have the ability to partner with people who are already in these areas or they have the ability to invest in stocks.” Carson added. 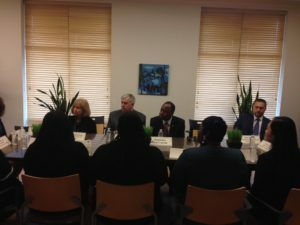 St. Louis Mayor Lyda Krewson, Missouri Governor Mike Parson, State Senator Brian Williams, and Congressman Lacy Clay also participated in the roundtable discussion. “There are housing challenges here and the more Secretary Carson can see it and eye ball it himself, the better understanding he will have.” Clay said of Carson’s visit to St. Louis. There are 161 designated Opportunity Zones throughout Missouri.